Ah yeah! The Polygon Fill tool! Nice man thanks! Did not know it was a thing. Actually no, I done did placed her teeth colour and it still comes off as discoloured on the app, I even added a dot on somewhere obvious to see if it is the latest skin if I have not made any mistakes. but nope. Looks white in substance painter, but not the same in the app. What do you mean by discolored? Could you share or pm you current texture? the link doesn't work, but judging just by the filename, it has to be a ZIP file, 7z won't work. Has the Ilinir teeth situation been sorted yet? Cus it is still there. Aaaand I wanna upload this damn skin thats been sitting in my computer in non brown teeth condition. and i would recommend naming it something more specific to the skin to avoid the possibility of running into another skin named the same and to tell the end user what the skin is. Is it possible for someone to explain to me how I can edit the textures in Blender? I've been trying to make sense of the tutorial from the wiki but my brain is too small to understand how to apply that to the Yiffalicious characters. As a skinmaker I'm really glad with the options we've got to create our own skins. But there are still some flaws and missing textures here and there. For instance there is the eye issue with the Horse and Bunny where ony one eye gets colored or gets colored slightly. Also there are still some textures missing like the hair for Maya and the tail hair for Khana. Will these issues be fixed with the next update? As I said I'm really happy with the skinning so far. But these issues somewhat limit the things we can make atm. I'm having a problem getting skins in at all, and I think it's to do with my %appdata% folder. I've seen people say when you instance a mesh in-game the texture folders will appear in %appdata%, but mine don't. I tried manually adding skins and it didn't work, then I tried downloading the Skin Manager and adding skins through there. It *seemed* to work, because it loaded into the Skin Manager all fine and dumped the skins in my %appdata% folder, but in game they just won't show. Tried pressing F5, reloading as admin, just nothing. Has anyone else had this problem? I would really love to make a skin but I don't want to spend the time texturing if I can't even get it in. Folders should appear in %appdata%\Yiffalicious\custom\textures, not %appdata%. @odes Sorry if I wasn't clear, yes I was looking there but there is still nothing. Textures appear there as the skin manager puts them there but nothing is there from the game itself. I've been working on a new skin and it looks good in Substance Painter but when I plug it in the hair color is all messed up. It's puke green!!! Also, the eyes are kind of semi transparent and the original skin is bleeding through. It's just me playing around and making my own skins, so if one of you artist who knows what their doing can help me that would be great. I don't know how it is for Bunny, but I do know that some of the colours are effects applied in game. A lot of the hairs in particular seem to have lighting or some other colour applied to it in some kind of blend. Definitely can be super frustrating. I've given up on making skins of some body parts because of this. 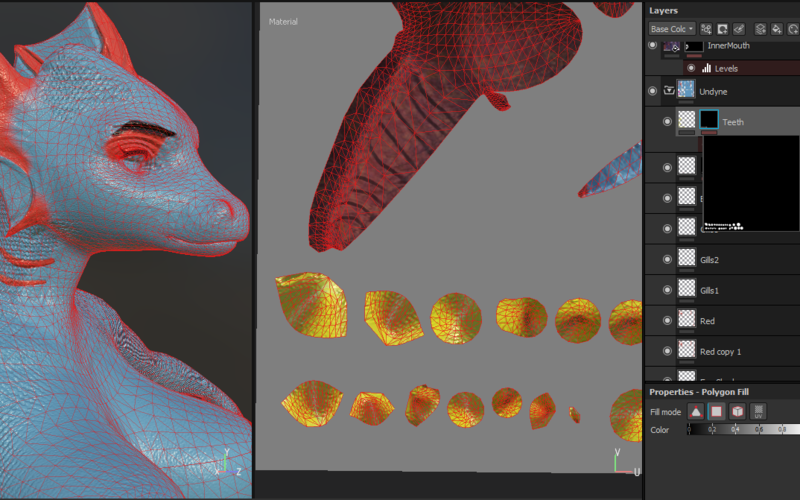 Where i can find meshes for Substance Painter? FOX SHAFT SKIN NOW COMPATIBLE WITH SKIN MANAGER!